The Free Application for Federal Student Aid (FAFSA) is the most important part of the Financial Aid process. It is necessary for students who plan to attend two-year, four-year, and technical schools. The form requires financial information of the student, and in MOST cases, as students are still considered dependents, the family’s financial information is needed as well. For high school students who are entering college, the FAFSA needs to be completed early, so that schools have time to review the information and make a financial aid package. The FAFSA becomes available on October 1st. Each school’s website will list its FAFSA filing deadline. It is CRUCIAL to meet this deadline so students don’t miss out on Financial Aid (grants, work-study, or scholarships) from their school. Some schools give out aid on a first-come, first-serve basis. After the deadline, there often isn’t much aid left. Below are some good resources to help you fill out the FAFSA correctly. 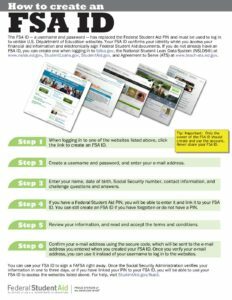 The first document is “How to Create an FSA ID.” An FSA ID is your electronic signature; BOTH the student and ONE of the student’s parents need separate IDs in order to sign the FAFSA. 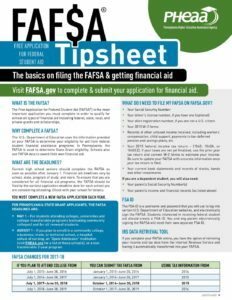 The next document is the “FAFSA Tip Sheet.” On this sheet, pay special attention to “What do I need to file the FAFSA on fafsa.gov?” As you will be using what are called “prior prior year taxes” (e.g. for the 2018-2019 academic year, you use 2016 taxes), you can utilize the IRS Data Retrieval Tool that is built into the FAFSA, but it is still important to have your tax returns on hand. If you have any specific questions or need help with any of this information, please stop by the high school Guidance Office or email Miss Sarah at sscott@huntsd.org. We’re here to help!